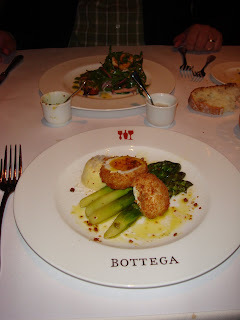 Our second night in Napa Valley we had reservations at Bottega in Yountville. Guess who came by our table!! Michael Chiarello was very nice. It was so cool getting my picture taken with him!! We both ordered an appetizer. Below is the Pecorino cheese pudding with crispy soft boiled egg & forno roasted Delta asparagus. Check out the size of the asparagus! I've never seen asparagus so big. And the egg!! It was absolutely amazing! The inside was soft and creamy but the outside was crispy. I have no idea how they did that! Now the best part - the Pecorino cheese pudding. All together, one of the best dishes I've ever eaten. 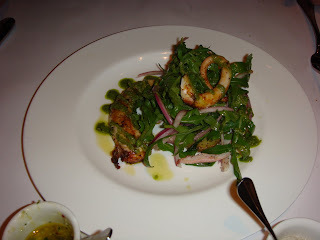 Zac had the Wood Grilled Octopus, with olive oil braised potatoes, pickled red onion, and salsa verde. The octopus was so tender, not at all chewy. Look how huge the pieces were! 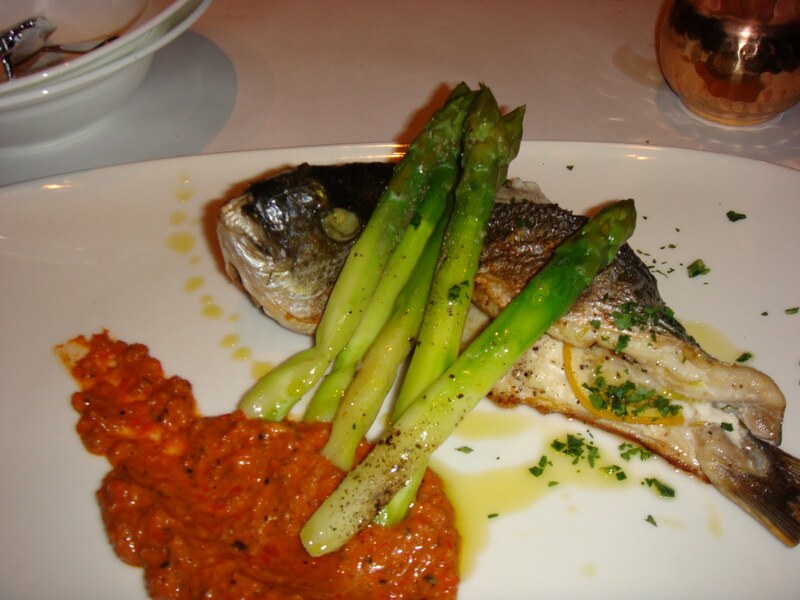 For our entrees, Zac had the Wood-oven whole sea bass with meyer lemon, forno roasted Delta asparagus, & sunflower seed Romesco sauce. Check out the teeth on the fish!! crazy! The sunflower seed Romesco sausce was absolutely amazin with the fish. 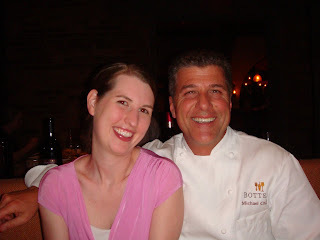 Neither of us have ever tasted anything like it, it was delicious! I had the Garlic and Calabrian Chili Roasted Dungeness Crab with crab-saffron aioli and bruschetta. The "top" of the shell just came off with the crab and more brushcetta on the inside. Quite a presentation! My hands got quite messy, but it was so worth it! I keep repeating myself on every dish I know, but this was and absolutely amazing dish. The crab legs were huge and so juicy. 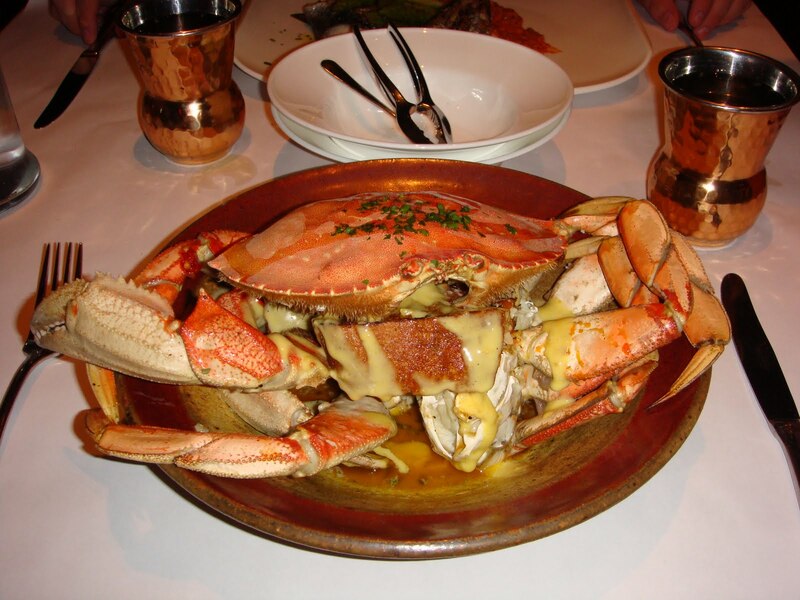 The aoili was just perfect with the crab, and drawn butter was in the bottom of the bowl for dipping too. Yum!! No dessert, too full after that wonderful feast! !